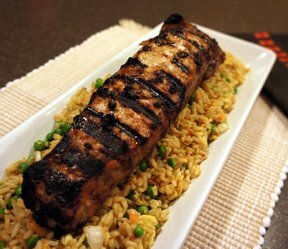 This pork comes out moist and full of flavor every time. It will melt in your mouth. And this recipe is perfect for a crowd. In a small food processor, combine garlic, rosemary, salt and pepper and olive oil, making a paste. 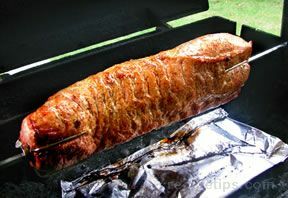 Rub over pork loin. Place in resealable bag and in refrigerator 4-6 hours. 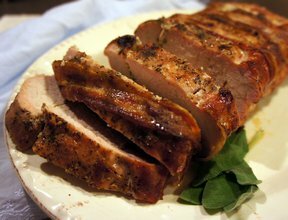 Take pork loin out of the refrigerator 1/2 hour before baking. Place pork loin into roasting pan adding about 1/4 cup chicken broth to the pan; cover. Cook until the pork is no longer pink in the center, about 1 1/2 hours. 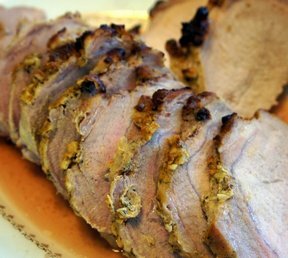 An instant-read thermometer inserted into the center should read 160 degrees F.
Place roast onto a platter and tent with foil. Allowing the meat to rest for at least 10 minutes with keep the juices inside. In a small bowl, combine cornstarch and cold water to form a paste. Heat the pan drippings and remaining broth over medium heat being sure to stir to loosen browned bits of food on the bottom. Whisk in cornstarch paste and continue whisking until thickened. Season with salt, if necessary. "I'm usually not a rosemary fan, but this had just the right amount. It was amazing."